Business We Believe In: Save the Date Originals — Catalyst Wedding Co.
Meet Angela, the founder of Save the Date Originals! Save the Date Originals does graphic design and printing for folks who want to make fun things to send to friends and family! "Send them something exciting!" 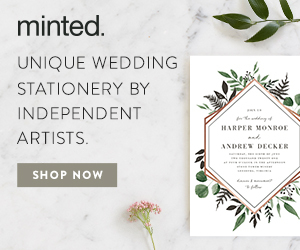 Angela is the founder of the company, and she has been making Save the Date Originals for eleven years! "Every month, a customer has a new idea for me to try out that would never have occurred to me — it's never boring! My specialty is save the date fridge magnets. Almost any rectangular size is available, plus heart shaped magnets and luggage tag shaped magnets. People can even get magnets made with shimmery card stock! My favorite project is probably a recent one where a customer asked me to make in invitation that looked like a record case with a record (round card) in it. Another challenge accepted, with fun results."